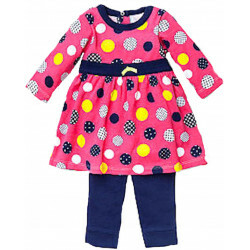 Molly & Millie 12-24 months baby girl bubble tunic with capri in bright colors of lime, navy, white turquoise, and hot pink. 100% cotton knit bubble tunic and 92% cotton 8% spandex capri set by Molly & Millie. This set is so special in the lime with hot pink, turquoise, white, and navy colors. The short sleeve bubble is banded at the bottom with applique flowers down the front turquoise sild flowers on the top and bottom flower with a flat flower and button on the middle (hot Pink) flower. The capris are bright, brights, and bright. On a navy background there are circles and flowers in the lame, navy, white, turquoise, and hot pink. A very colorfful spring and summer capri set for your little girl. Sizes: 12, 18, 24 months.